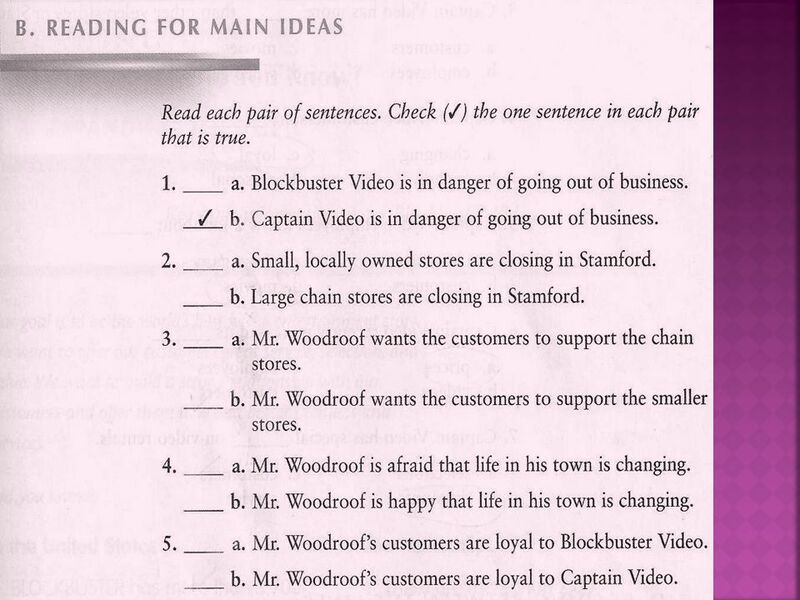 Richard Woodroof is the owner of Captain Video. Captain Video is a family-owned video store in Stamford. Two big chain video stores have opened in Stamford. 1 Richard Woodroof is the owner of Captain Video. Captain Video is a family-owned video store in Stamford. Two big chain video stores have opened in Stamford. Mr Woodroof sends a newsletter to all his customers. 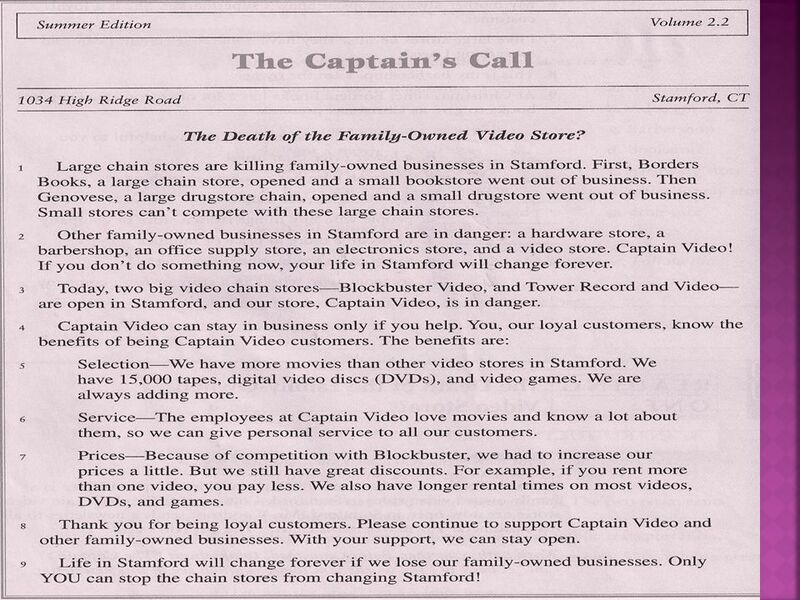 The newsletter is called “ The Captain’s Call.” In his newsletter, Mr Woodroof says that large chain stores are killing family – owned businesses in Stamford. When large chain stores open, family- owned businesses go out of business. 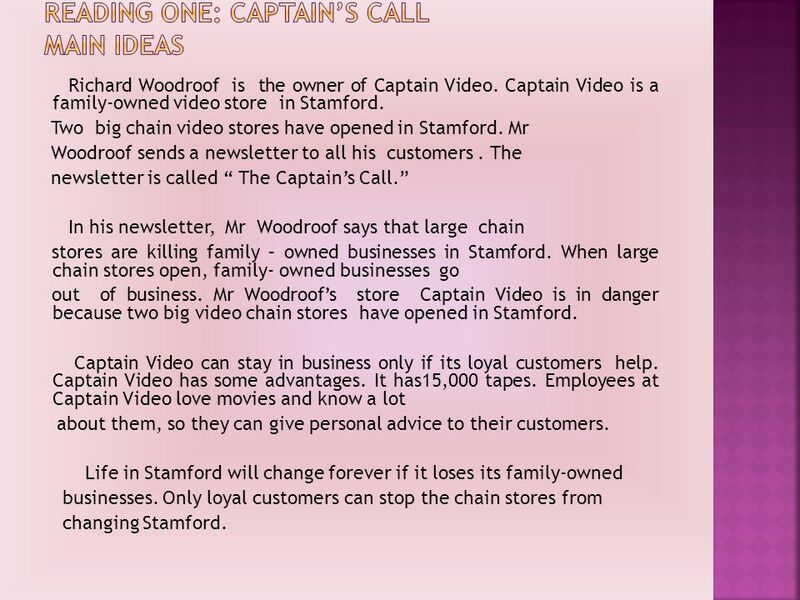 Mr Woodroof’s store Captain Video is in danger because two big video chain stores have opened in Stamford. Captain Video can stay in business only if its loyal customers help. Captain Video has some advantages. It has15,000 tapes. Employees at Captain Video love movies and know a lot about them, so they can give personal advice to their customers. Life in Stamford will change forever if it loses its family-owned businesses. Only loyal customers can stop the chain stores from changing Stamford. 4 Blockbuster is a chain video store. It has just opened in Stamford. Small video stores like Captain Call can run out of business because of Blockbuster.There are 2,000 blockbuster stores in 26 countries. Blockbuster has more than 5,700 video stores in America and 78,000 employees. Blockbuster wants to be the world’s best home entertainment store. It offers its customers great service, value and products. 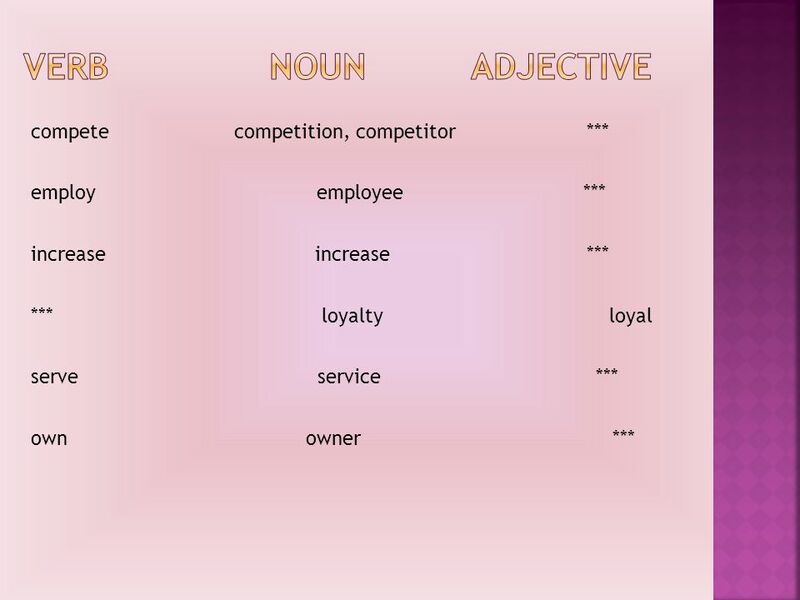 7 Complete the sentences with the correct words: compete / competition 1- Hyperpanda and Carrefour _________ for customers. 2-The ___________ between Hyperpanda and Carrefour is very strong. employees, employs 1- Blockbuster Video ________ over 93,000 people. 2-Blockbuster Video has 78,000 ___________. loyal, loyalty 1- Our ________customers always come to our store. 2-We need your ____________ to stay in business. 8 increase (verb), increase (noun) 1-Captain Video didn’t want to ________ its prices too much. 2-The _________ wasn’t very big. It was only one riyal. serves, service 1- Starbucks ___________ very good coffee. 2- The ___________ at Starbucks is very good. owner, owns 1- My brother ____________ three stores. 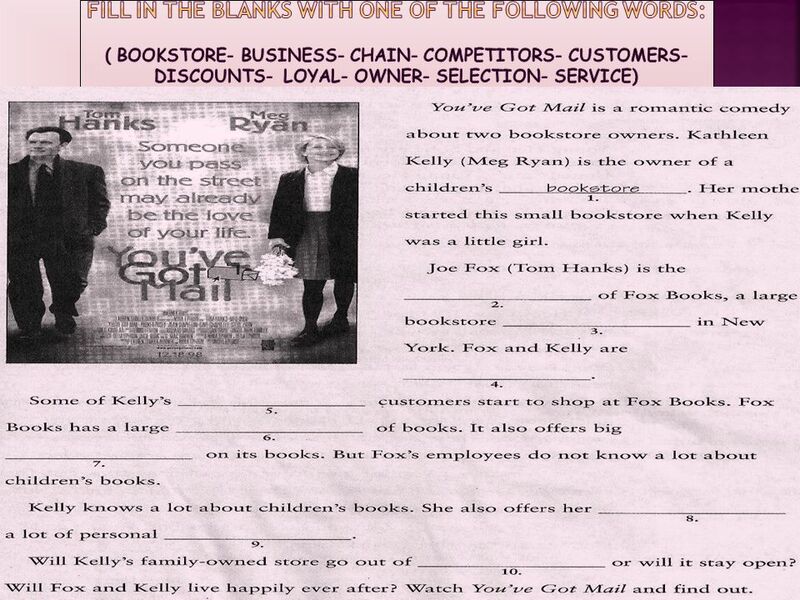 2-He is the ______ of three stores. 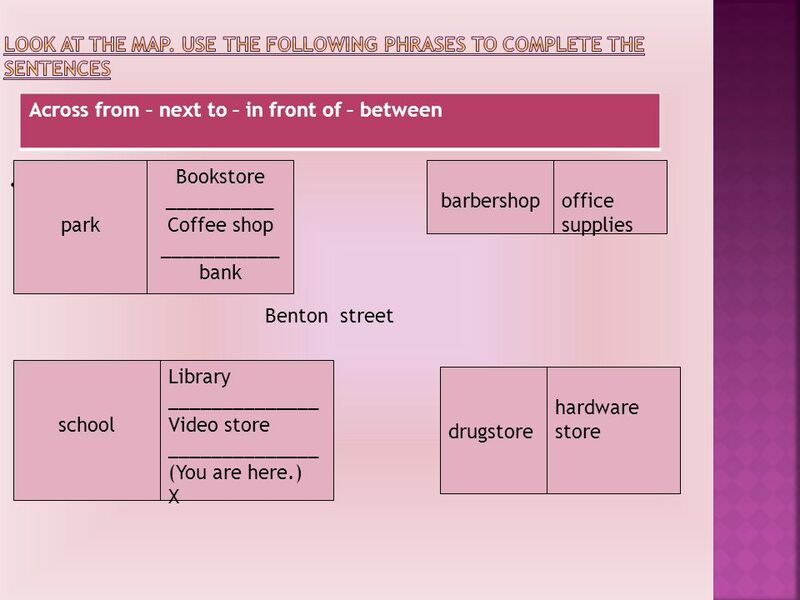 10  We use “ There is + a count noun” ( singular )  There is a shop on my street. 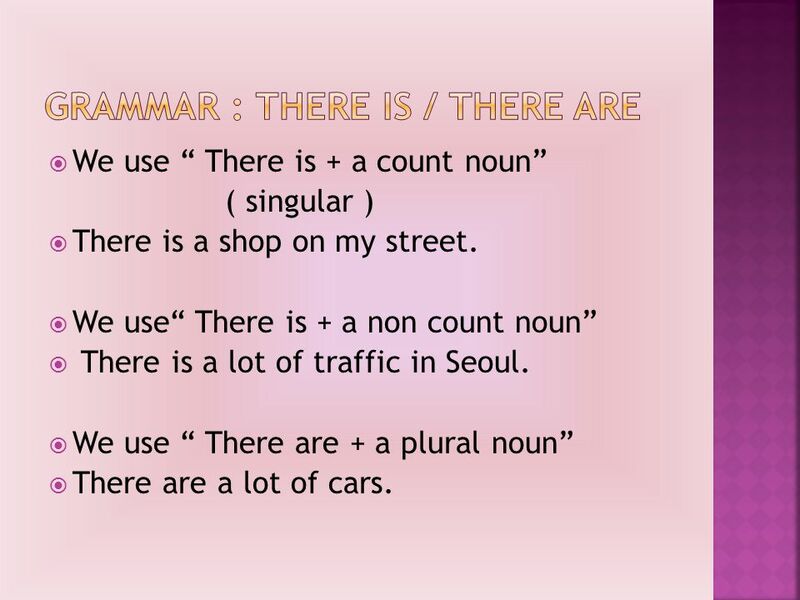  We use“ There is + a non count noun”  There is a lot of traffic in Seoul.  We use “ There are + a plural noun”  There are a lot of cars. 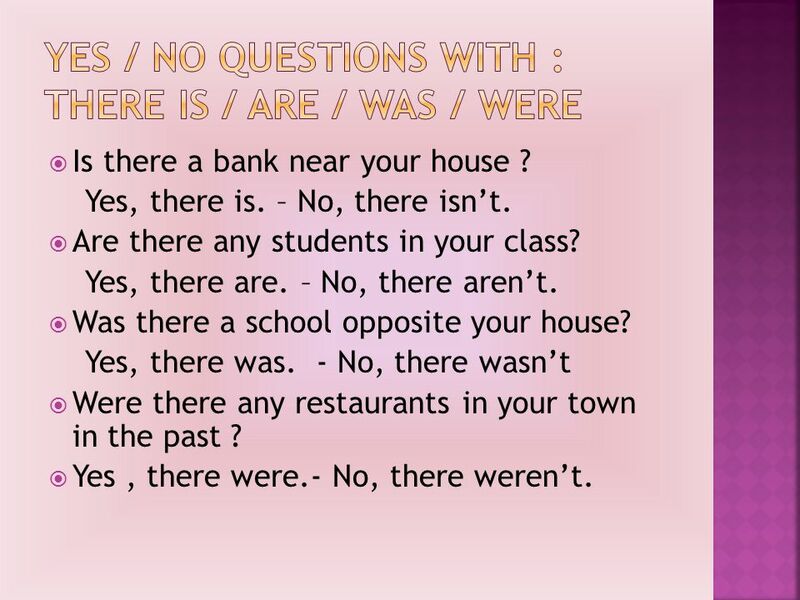 11  We use “ There was / There were” when we talk about the past. 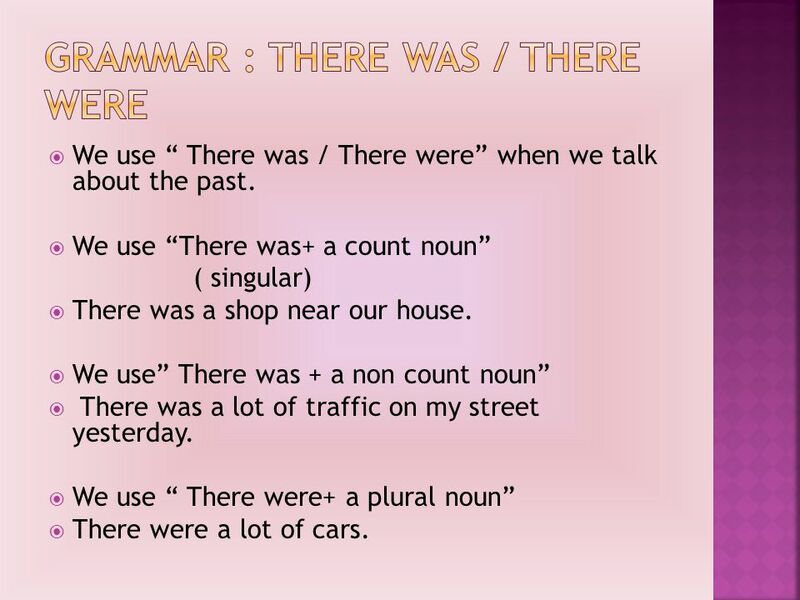  We use “There was+ a count noun” ( singular)  There was a shop near our house.  We use” There was + a non count noun”  There was a lot of traffic on my street yesterday.  We use “ There were+ a plural noun”  There were a lot of cars. 12  Is there a bank near your house ? Yes, there is. – No, there isn’t.  Are there any students in your class? Yes, there are. – No, there aren’t.  Was there a school opposite your house? Yes, there was. - No, there wasn’t  Were there any restaurants in your town in the past ?  Yes, there were.- No, there weren’t. 14 1- ____________ a park in this town? 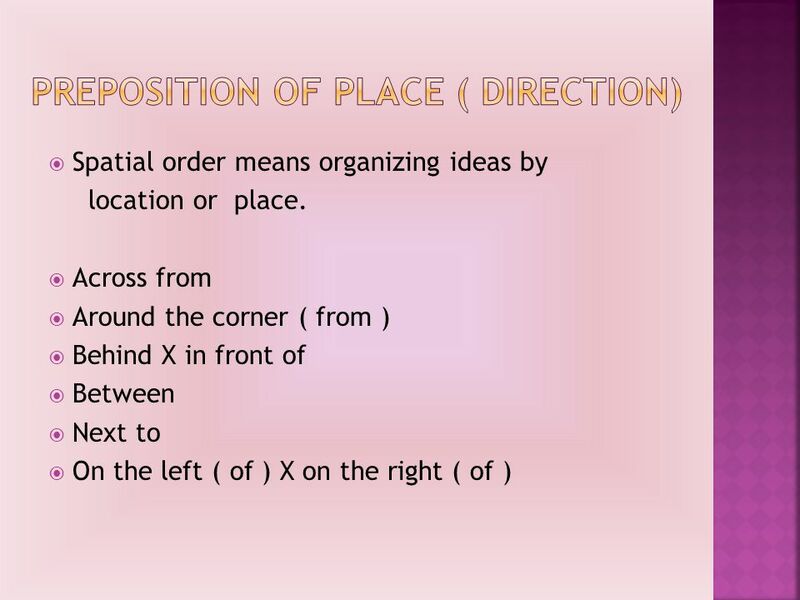 2- ____________ some places to eat near the school? 3- _____________ a gallery by the museum. 4- ____________ several bookstores on Main Street. 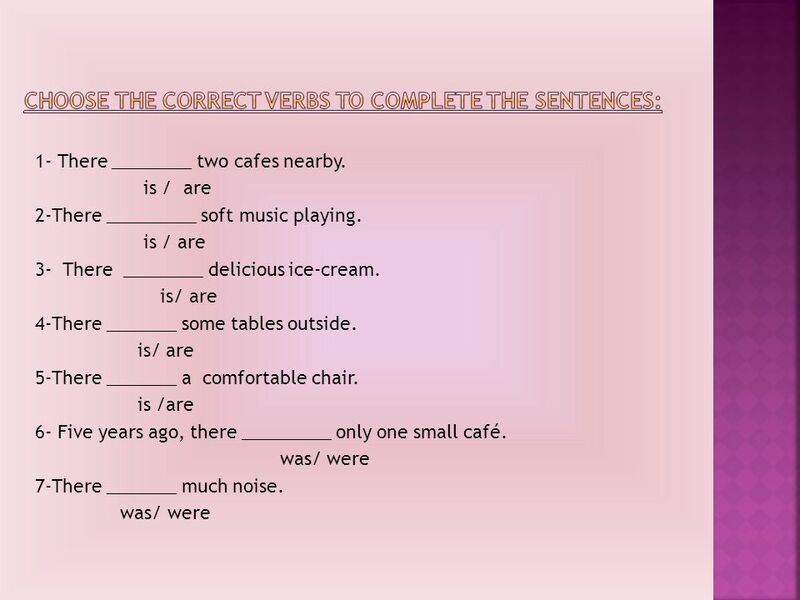 Complete the questions and statements with was there, were there, there was, or there were. 1- _____________ a concert last night? 2- Yes, ___________ many people. 3-____________ news reporters and cameras? 4-Yes,__________ a comedy show, too. 17 1- You are _____________ the video store. 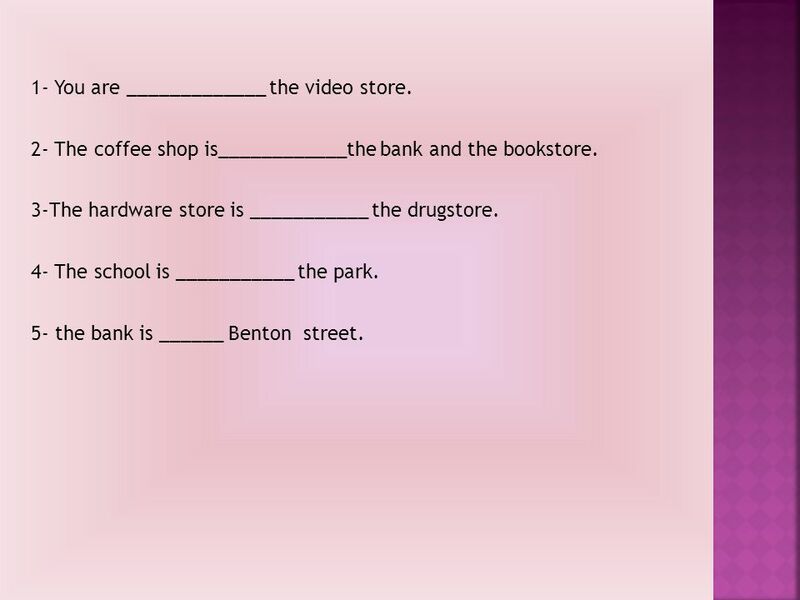 2- The coffee shop is____________the bank and the bookstore. 3-The hardware store is ___________ the drugstore. 4- The school is ___________ the park. 5- the bank is ______ Benton street. Download ppt "Richard Woodroof is the owner of Captain Video. Captain Video is a family-owned video store in Stamford. Two big chain video stores have opened in Stamford." SECOND PARTIAL REVIEW INTENSIVE ONE. I’m your new neighbour. -Where does the conversation take place? -What is the man looking for? -What does the woman say? -What does the woman suggest? English III Around town…. In Unit 6, you’re going to learn how to. Grammar in a nutshell. Past simple of to be (zijn) IYou (singular & plural) HeThey SheWe It was were When you make a question you put the form of to be.